On February 13, Agenda 360, a regional action plan, announced its goals, priorities and strategies for southwestern Ohio including Cincinnati. The event was attended by more than 150 volunteers, government officials, business and civic leaders. Adding an additional 150,000 20 to 34- year-olds to the region’s workforce, an increase of 50 percent. Adding 200,000 net new jobs in the region, an increase of 50 percent over the historical job growth rate. Creating economic self-sufficiency for all, and incorporating the United Way goal of income at a minimum of 250 percent above the federal poverty level for all households. With this, Agenda 360 has set some lofty goals, but it is not without some guidance. In the fall of 2006, about 50 local civic leaders and officials journeyed to Boston to see how they had improved on some of their lingering issues for their region. What they discovered is that the issues that plagued the Boston metropolitan area were the same issues that plagued Cincinnati’. Except that Boston had set a basic list of priorities towards improving the city that were paying out dividends, so to speak. 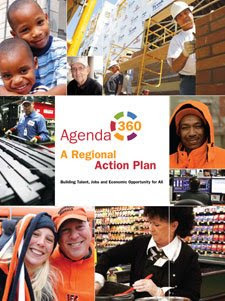 In early 2007, Agenda 360 was launched using Northern Kentucky’s Vision 2015 growth plan as a model. A group of leaders from more than 30 organizations, including heads of labor unions, business groups, social service agencies and public officials, created a framework for tackling the lingering, difficult issues that face southwest Ohio. It partnered with the United Way State of the Community Report, so that poverty levels, educational attainment and health status, for instance, could be closely monitored and tracked – giving Agenda 360 a level of accountability. That 93% of respondents strongly endorsed the idea of transforming the region into a leading metropolitan area for talent, jobs and economic development. That Agenda 360 be action-oriented, contain measurable goals, and be held accountable, which was sanctioned by 95% of respondents. That the vast majority, 88%, agreed that it was critical that all, regardless of background or view, be included in the discussion. Creating a quality place, where the region creates strong, attractive and functional locales in which to live, work and play. Investment should be placed in strategic locations that have high potential for development and growth, and investments should include smart growth principles, arts and culture corridors partnered through community-based arts and cultural centers, and interconnected green spaces. Locales should be more environmentally sustainable and progressive as well. Fostering business growth, in which the region uses its strengths to retain, attract and create businesses and jobs. Focus should be placed on established industries and ones that are emerging, such as the advanced energy, information technology and life science industries. In addition, the region’s strengths – it’s health care industry and the international airport, should be leveraged to foster additional growth. Retaining a qualified workforce, in which the region retains its younger generation and provide them with the skills and tools necessary to find good jobs today and into the future. Focus should be placed on the preparation of children, to ensure that they are prepared to enter Kindergarten, and that they are well nurtured into college. In addition, parent-teacher institutes should be formed to keep parents engaged in education, and barriers to college affordability should be eliminated. Finally, the sole focus should not just be on traditional students, but also the adult workforce – more important today during these difficult economic times. Improving transportation, by expanding our options for moving people and freight across the region. Investment should be made into the replacement of the Brent Spence Bridge, a backbone of transportation and economic vitality for the Cincinnati region, and into other transportation nodes that have been built and constructed by other savvy metropolitan regions. Multi-modal freight via road, water, air, and rail should also be emphasized. Including all and working to create a welcoming community to which all people of all backgrounds and views are embraced and their differences are used not to divide, but to be used in the foundation for a community’s success. This includes providing health care for all at an affordable price through the Access Health 100 program. A healthy region cannot exist without healthy citizens. And increasing government collaboration, in which many of the cities, counties and townships work together towards common goals.